PL:BECS provides highly detailed, color-coded installation drawings for residential windows. Despite 5,000 years of construction history, basic problems with the design and installation of window systems remain wide-spread. PL:BECS has analyzed innumerable window failure problems, affecting both commercial systems, such as structural curtain-walls and store-front systems, as well as residential-scale windows, including vinyl, extruded aluminum, wood-framed, clad, fiberglass, and steel sash types. Deep familiarity with the numerous window failure modes has allowed PL:BECS to develop sophisticated installation methods to preclude window-related problems even in extremely challenging situations, such as within feet of the open Pacific coast. These methods have been thoroughly tested, both through formal lab-testing but more importantly, by over two decades of successful window installations. 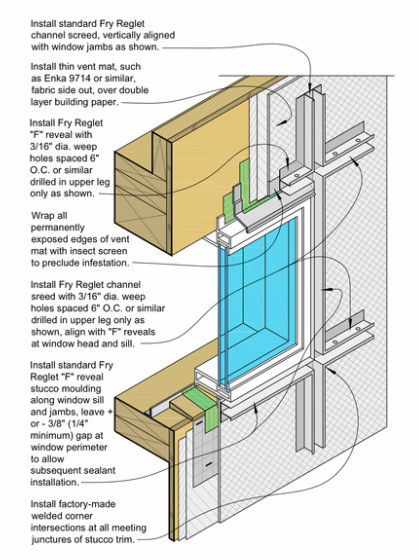 To assist the construction professional installing windows in complex cladding situations, PL:BECS has developed highly detailed, sequenced, installation details depicting PL:BECS recommendations. A library of pre-made detail sequences is available separately from project-specific PL:BECS consulting services. PL:BECS expertise in window systems has also proved extremely useful in solving problematic installations and unit designs, assisting manufacturers in improving their window designs, as well as acting on behalf of manufacturers, installers, and owners in resolving window-related disputes.